Back to school bullies conjure up all sorts of images. I still remember my first beating, girl-style. I still cringe when near a school cafeteria–that loud clatter of trays, sharp voices stinging my ears, and the mean girls. You remember don’t you? She walks up to you in the lunchroom, her pretty teeth flashing from beneath a sweet smile, a bow in her hair. You think, “Wow, I’m so lucky. She’s trying to make friends with me.” You smile back. But, there’s nothing nice about her smile. She’s only practicing her punch. She plans to use you to make herself more powerful. Girls punch each other with words. Her question is a command. She’s clearly mastered the art of punching with words. Her victim usually bows her head and moves away, sitting alone at another table for the remainder of the school year. 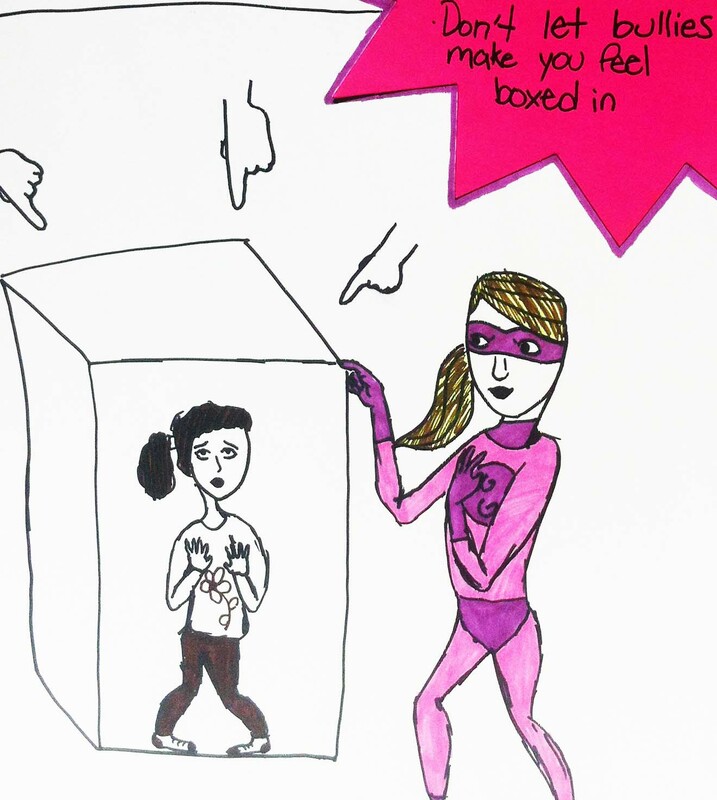 Girl power packs a deeper punch. With all the girl power in the forefront of the news and media, no one seems to get to the core of a very real divide among women and girls. Mean girls still rule the roost. My daughter learned this first-hand last year. My daughter had grown taller than the rest of the fourth graders. She preferred boy shorts instead of skirts and tiaras. Oh yeah, and she liked to eat. All this of course made her an easy target for mean girls. Then they fumbled with her hair until she marched off to the bathroom and ripped her ponytail out of her hair. She then let her hair hang walking with her head down becoming the monster they wanted her to be. Her worst nightmare lived in the lunchroom. When she unpacked her lunch, a chicken sandwich, they held their noses and slid away from her. “Your lunch smells. I can’t stand it. Go to the other table,” they whined. Those few sharp words effectively damaged her self-esteem and isolated her at the same time. She didn’t want to be around them, and she definitely didn’t want to eat. I felt so frustrated when we’d get home and she’d be starving, gorging down any morsel in sight. But, later, in that quiet space right before bed, she told me why she did that. She said she was afraid they’d make fun of her again. I then became her shoulder to cry on with bits of advice along the way. So, this year, she plans to fight back with her anti-bullying campaign. 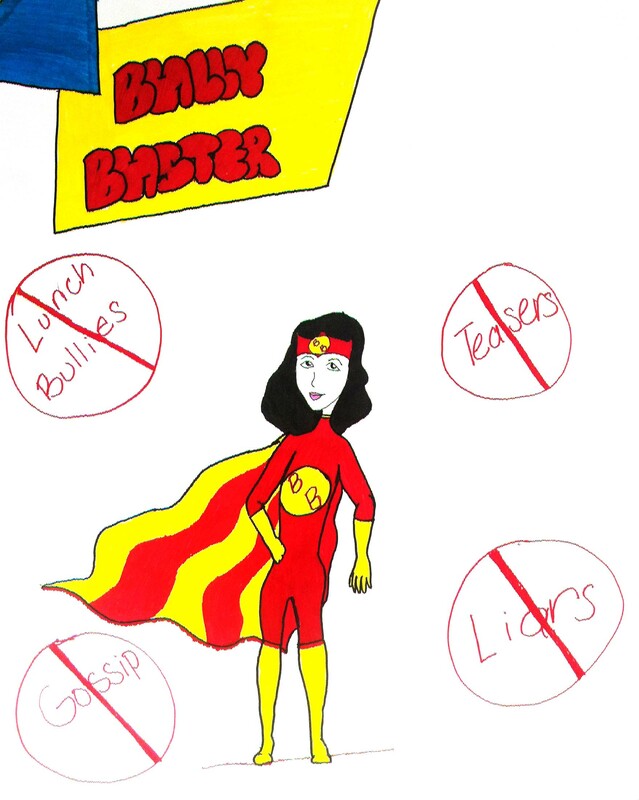 She created a poster depicting a bully-busting superhero resembling wonder woman. Most likely, she’ll become an even bigger target because she’s fighting back in a loud and clear way. They will talk. And, they will do it with those same spiteful yet artful words. You know what I’m talking about. Look around you, the gossip of mean girls still streams over the Internet, the television, the news. Everybody listens and often enough everybody follows. Why do you think so many girls and women attempt the daunting task of wearing skinny jeans? But, this time, my daughter will be better prepared to deal with the backlash of a bully backed into a corner. She’ll know what it feels like to take a punch and she’ll be practicing how to bounce back. And, me, I’ll be there to catch her when she falls or at least pick her up, brush her off, and give her a shoulder to cry on. How I dread this. My daughter is in second grade this year. Right now she seems oblivious to the cattiness that is already starting. Already! But I see it and I hear it when I go to her school. She has been blessed (or cursed–we’ll find out later) with having an older brother and has never been into girl drama. I hope I am strong enough to help her. Sounds like your daughter has the right frame of mind this year. And so do you. Good luck to you both! It’s good that she’s oblivious. Eventually she won’t be, then welcome to the world of counseling a daughter. Do you ever wonder what the mothers of the mean girls think of their children? Proud or ashamed? Or clueless about it all? They never seem all that keen to stop their girls being bullies which would suggest pride, but perhaps they’re also trying to ignore that they’ve somehow raised a bully. What do you think? I think both. Some mothers are so busy working and their daughters are mimicking what they see on television. Some moms actually act that way so their daughters copy them. 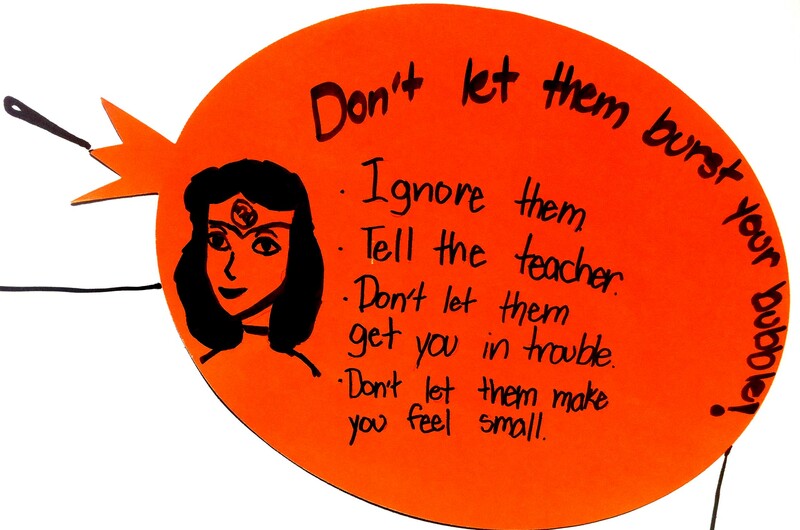 I’m trying to teach my daughter a balance between facing the problem head-on and letting it be. It takes a lot of energy to fight it. The key is to stay in tune to the signs that may indicate bullying is going on at whatever level. Education is also key and we all have to do our part to prevent it and develop strong campaigns against it. I hope all of you who have children still in school especially young children do not have to face these issues. I’m so sorry to hear about what happened to your daughter. I was bullied during high school and it has left an emotional scar; my mother was not there for me. But, I do hope everything turns out okay in the end and I root for you and your daughter in the anti-bullying campaign. I wish I understood why bullying even exists…it is so frustrating! As a teacher and future mother, it is on my mind every day. Great post! Thanks for following my blog today. It’s a horrible game people play. It starts when you’re young and only gets worse. Never stops being frustrating. As a fellow teacher and a mom, I feel for you. Thank you for your comment. I’m feeling my way around the WordPress world and it seems to only get better as the weeks go by. So happy to find you and follow you.